If you prescribe for patients with arrhythmias, you will want to keep this valuable paperback close at hand. The Second Edition of this valuable reference responds to changes in the available medications as well as in the way they are currently used. Dr. Fogoros considers all the most recent drugs, plus promising drugs under investigation, to give you a full picture of therapeutic options. 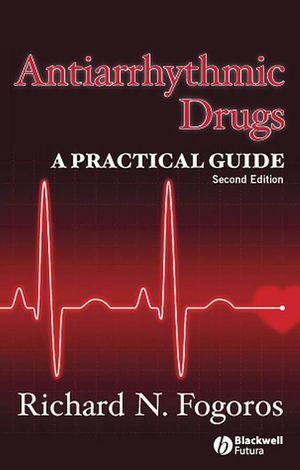 With Antiarrhythmic Drugs: A Practical Guide, Second Edition, you will have dependable information on how each drug works and when each one is indicated so you can give your patients the best possible treatment. Chapter 1 Mechanisms of Cardiac Tachyarrhythmias. Chapter 2 Introduction to Antiarrhythmic Drugs. Part 2 Clinical Features of Antiarrhythmic Drugs. Chapter 3 Class I Antiarrhythmic Drugs. Chapter 4 Class II Antiarrhythmic Drugs; Beta-Blocking Agents. Chapter 5 Class III Antiarrhythmic Drugs. Chapter 6 Class IV Drugs: Calcium-Blocking Agents. Chapter 7 Unclassified Antiarrhythmic Agents. Chapter 8 Investigational Antiarrhythmic Drugs. Chapter 9 Common Adverse Events with Antiarrhythmic Drugs. Part 3 Antiarrhythmic Drugs in the Treatment of Cardiac Arrhythmias. Chapter 10 Basic Principles of Using Antiarrhythmic Drugs. Chapter 11 Treatment of Supraventricular Tachyarrhythmias. Chapter 12 Treatment of Ventricular Arrhythmias.